This is a list of corticosteroids (glucocorticoids and mineralocorticoids) or derivatives of cortisol (hydrocortisone). Most esters of these corticosteroids are not included in this list; for esters, see here instead. The most common structural modifications in synthetic corticosteroids include 1(2)-dehydrogenation, 6α-, 9α-, 16α-, and 16β-substitution (with a halogen or methyl group), 16α,17α-acetonidation, and 17α- and 21-esterification. Cortisol (hydrocortisone), the major endogenous glucocorticoid. Note that the glucocorticoid activity of progesterone and 17α-hydroxyprogesterone is very weak (>100-fold less than that of cortisol). The above list includes precursors and intermediates in corticosteroid biosynthesis. In addition to the above, various progesterone derivative progestins such as chlormadinone acetate, cyproterone acetate, medrogestone, medroxyprogesterone acetate, megestrol acetate, and segesterone acetate possess weak glucocorticoid activity which can manifest clinically at high dosages. 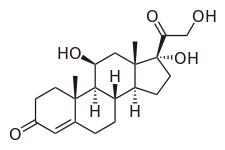 Dexamethasone, one of the most widely used synthetic glucocorticoids. ^ Pijnenburg-Kleizen KJ, Engels M, Mooij CF, Griffin A, Krone N, Span PN, van Herwaarden AE, Sweep FC, Claahsen-van der Grinten HL (2015). "Adrenal Steroid Metabolites Accumulating in Congenital Adrenal Hyperplasia Lead to Transactivation of the Glucocorticoid Receptor". Endocrinology. 156 (10): 3504–10. doi:10.1210/en.2015-1087. PMID 26207344.